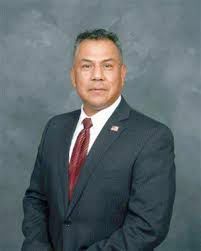 DONNA — The Donna school district board of trustees voted late Tuesday evening to place Superintendent Fernando Castillo on paid administrative leave effective Friday. The decision came after three hours of executive session and with a 4-3 vote in favor of the suspension. This after Castillo received less than favorable reviews in a district audit released in September. And most recently, a ruling by a appeals court that stated two of the trustees who approved Castillo’s hiring — David de los Rios and Dennis Ramirez — were not legally appointed to the board, making Castillo’s contract, and other board decisions in which those two votes were crucial, voidable. On Tuesday night, the board also voted to place Filomena Leo, who most recently served as interim superintendent for the Weslaco and Sharyland school districts, as interim-superintendent while they make a final decision. A timeline of when Leo will start was not made clear. Ceniceros said that there will be a process of investigation and further deliberation but that the board doesn’t have a timeframe yet for the process. Castillo refused to comment after the board’s decision, only saying, “You heard what they had to say.” His contract was approved on Aug. 30, 2016, after being named deputy superintendent following the suspension of former Superintendent Jesus Reyna in June 2015. A month after calling for a superintendent search, the board of trustees approved Castillo’s five-year contract with a $210,000 annual salary plus benefits. But the November election brought mostly new faces to the board, and one of their first moves was to hire an outside company to conduct a forensic audit into the school district. The audit, conducted by Weaver and Tidwell, included employee interviews, review of administrative procedures, environment overview and district culture. And some of the most concerning issues found had to do with the superintendent’s appointment of administrators who were not qualified for the positions. The same was found to be the case of Jose Villanueva, who was appointed by Castillo to the position of assistant superintendent of human resources. In previous meetings the board voted to terminate Valdez and reassign Villanueva to principal of 3D Academy. Trustee Alicia Reyna said that the focus should be in filling these positions with the right candidates and give Castillo a chance to meet the goals set by the board.